Carbohydrates, also referred to as saccharides, are a type of biomolecules. Carbohydrates are used by the body to store energy, and they are all comprised of the three same basic elements: carbon, oxygen, and hydrogen. Carbohydrates can be starches, sugars, or other polymers, and carbohydrates can be obtained through grains, vegetable, fruits, and beans. Examples of carbohydrates used by the body include: glucose, fructose, sucrose, lactose, and cellulose. Before taking a look at these specific carbohydrates, let’s go over the chemistry, structure, and uses of carbohydrates in general. The term carbohydrates refers to the fibers, starches, and sugars found within foods. They are found in vegetables, grains, fruits, milk, and more. Aside from carbohydrates, proteins and fats are the other types of macronutrients the body needs. Carbohydrates are the substances that give fuel/energy for the body’s central nervous system and enable the muscles to do their work. In addition to being used as energy, carbohydrates function to prevent proteins from being consumed as energy. Carbohydrates are necessary for the function of the brain, and for the stabilization and creation of memories and moods. Carbohydrates can be separated into two different groups: simple carbohydrates and complex carbohydrates. The primary difference between complex and simple carbs is how the quickly the carbs are metabolized, how fast it is digested and absorbed. Simple carbs are digested faster than complex carbs. Carbohydrates are biomolecules made out of three different elements: carbon, hydrogen, oxygen. The ratio of hydrogen to oxygen atoms is approximately 2:1 in most examples of carbohydrates. Carbohydrates are a type of simple organic compound, made out of ketones of aldehydes with an additional hydroxyl group included. Monosaccharides are the simplest possible carbohydrates, and they share this basic structure: (C-H20)n, where the value of n must be three or greater. Two of these monosaccharides are fused together to create a disaccharide. Both disaccharides and monosaccharides are referred to as sugars, and they typically end with the “-ose” suffix. Polysaccharides and oligosaccharides are created when two or more monosaccharides or disaccharides are joined together. Simple carbs, monosaccharides, are usually found in fruit and milk products. Two sugar carbs are often found in dairy products. While simple carbs are found in soda and candy, because of the fact that they are made with refined sugars and possess no vitamins or minerals they are called empty calories. Complex carbohydrates are those that possess three or more sugars, and they are usually found in high starch foods like peas, potatoes, corn, and peanuts. The body breaks down carbohydrates and turns them into smaller molecules of sugar like fructose and glucose. The small intestine is responsible for absorbing these small sugar molecules and sending them to the liver where they are eventually converted into glucose. Glucose is carried, along with insulin, through the bloodstream and around the body enabling the body to convert the glucose into energy that will be used to carry out basic physical activities. In the case that the glucose isn’t needed immediately for the production of energy, up to 2,000 calories of glucose can be stored away for later use, put into stores of glycogen found in the liver and skeletal muscles. Beyond this, the carbs are stored as fat. Insufficient levels of carbohydrates will lead to the body consuming protein for fuel. The body needs protein to make muscles so if one continues to go without consuming carbs their muscles can atrophy. Lacking the correct amount of carbohydrates can also lead to stress on the kidneys. Fiber is necessary for the complete digestion of food, and it is used by the body to have healthy, normal bowel movements. Fiber is also thought to decrease the risk of chronic diseases like diabetes and coronary heart disease. While fiber is a form of carbohydrate, unlike starches and sugars fiber isn’t absorbed by the small intestine as it passes through it, and therefore it isn’t converted to glucose. By contrast, fiber passes through the small intestine into the large intestine mainly intact, where it is converted to fatty acids, carbon dioxide, and hydrogen. Approximately 14 grams of fiber should be consumed for every 1000 calories, and fiber can be gained from foods like legumes, vegetables, grains, and fruits. Carbohydrates can also be gained from some kinds of vegetables, both starchy and nonstarchy. Even certain kinds of dairy products can have carbohydrates, though in relatively small amounts. Nonstarchy vegetables such as green beans, carrots, celery, and lettuce contain some amount of carbs while starchy vegetables like corn and potatoes contain more substantial amounts of carbohydrates. You may have heard of “good carbs” and “bad carbs”, but what is the distinction between the two forms fo carbohydrates? 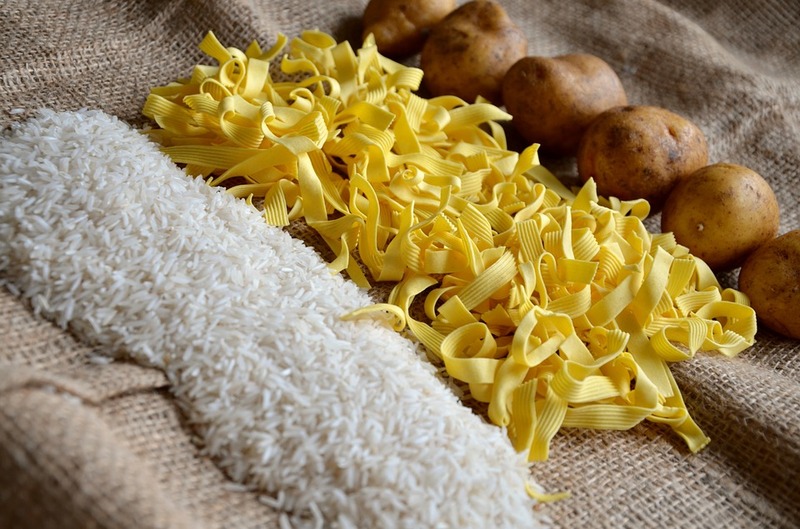 The idea of simply good and bad carbs is s a bit of an oversimplification, but in general bad carbs referred to carbohydrates that originate from foods which are low in nutritional value. 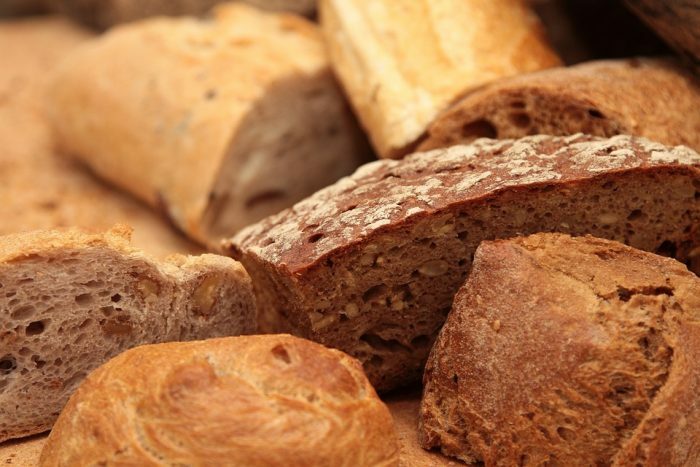 Carbs gained from foods like soda, sweet pastries, white bread, white rice, and other foods made with white flour offer up simple carbs which lack much nutritional value, and therefore are considered “empty carbs” or “bad carbs”. In contrast, complex carbohydrates come from foods like legumes, beans, fruits, whole grains, and vegetables and these carbohydrates are not only processed slowly in comparison to simple carbs, but they also have many more nutrients within them. In general, one should try to consume carbohydrates that are high in nutrients and fiber, and low in sodium and fat, as well as free of refined sugars and grains. Meanwhile, one should try to avoid carbs which are extremely high in calories and come with refined sugars or grains, as these are often low in nutrients and in fiber. Consuming the right types of carbohydrates benefits the body in many different ways. For instance, a JAMA Internal Medicine study recently implied that people who were on a low-carb diet for a year or more had increased susceptibility to depression, anxiety, and anger than those who are on a high carb, low-fat diet. For this reason, some scientists speculate that carbohydrates play an important role in the production of serotonin, an important neurotransmitter in the brain responsible for regulating moods. A healthy amount of carbohydrates may also have positive benefits when it comes to memory, with one study conducted at Tufts University finding that overweight individuals who cut carbs out of their diet for more than one week had lowered spatial memory, visual attention, and general cognitive skills when compared to those who ate a healthy amount of carbohydrates. Eating the right types of carbohydrates can also help you maintain a healthy weight. Many “good” carbohydrates, specifically those that come from vegetables and whole grains contain fiber, which helps you feel full and eat less. Low-fat and low carb diets seem to have similar success rates in the long run, though early on low-carb diets seem to be more successful according to some studies. Proper fiber intake also helps control cholesterol levels. The body’s digestive process uses cholesterol to engineer bile acids, and as this process goes on the liver utilizes cholesterol from the bloodstream in order to create more bile acid, the effect of which is to slice the level of LDL “bad” cholesterol. Now that we’ve gone over the structure and role of carbohydrates in general, let’s go over some specific examples of carbohydrates. Glucose – Glucose is the most abundant out of all the monosaccharides, and it has the chemical formula C6H12O6. It is produced by algae and plants during the process of photosynthesis, which uses light to create energy. Other animals consume plants to secure this glucose, as glucose is an important source of energy for all organisms. Humans metabolize glucose through the process of glycolysis, using it to carry out cellular respiration and producing carbon dioxide and water as a byproduct. Fructose – Fructose is a monosaccharide, a single sugar, which has the same chemical formula glucose possesses, though the molecules are arranged in a different fashion. 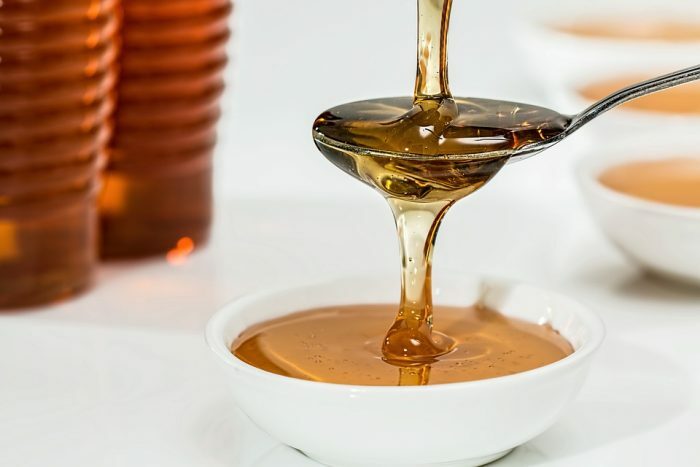 Fructose is sometimes referred to as fruit sugar, and along with the other carbohydrates it serves as a critical source of energy for the body. Fruit and table sugar are the two primary sources of fructose. Sucrose – Unlike fructose and glucose, sucrose is a disaccharide composed of two monosaccharides. Most plants naturally produce sucrose, and it is from these plants that table sugar is derived, being extracted and refined from plants like sugar beet and sugar cane. Pure sucrose may be created by a sugar mill through the processing of sugarcane, but more often the cane is crushed and refined in order to create raw sugar. Lactose – Lactose is a disaccharide found primarily within dairy products, and it constitutes somewhere between 2 to 8% of milk. After the milk has been crippled or strained, the milk plasma or whey is comprised of about 5% lactose. Infant mammals drink milk rich in lactose, and an enzyme within the body breaks the lactose molecules down into galactose and glucose. The inability to break down lactose is the condition responsible for lactose intolerance. Cellulose – Cellulose has the chemical formula C6H10O5, and it is a polysaccharide found in many plants and algae. Cellulose is one of the primary components of the cell wall in the cells of plants. Cellulose is the world’s most abundant organic polymer, and it is used to create cotton fibers. Cotton fibers are made out of almost 90% cellulose. Cellulose is also an important component in paper and cardboard products. Humans cannot digest cellulose, but some animals like ruminants (cows and similar animals) are capable of digesting cellulose, as are termites.